Before purchase，please read it carefully. Who can't use this hearing machine? This hearing machine is suitable for those has air conduction hearing loss. But for these people, is forbiddon to use. *According to audiogram chart, if the frequency is between 0-30dB no need to use. *Those has suddently deaftness, especially happen in 3 month. *Those has tinnitus, one ear or two ear. *Those has quickly hearing loss problem. *Those hearing is different from left and right ear without any reason. *Those has serious otitis externa in both ears, pus in otitis media, full closure in double outer ear. How to check my hearing loss? Please fill in this questionaire. If you can hear all the mention sound, you no need to wear hearing amplifier. If you can't hear 1-4, not clearly in 5-9, you need to wear.If you only can hear No.10 sound, you need wear high power hearing amplifier. 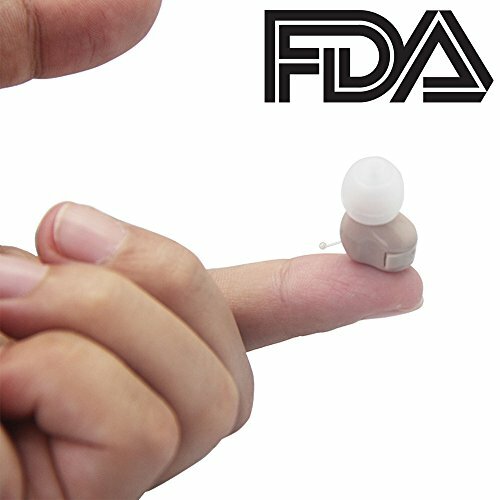 This hearing amplifier with super mini size, it will be very well to be hiden.It is for slight and moderate hearing loss people. How to choose hearing amplifier? We suggest you have hearing text in hospital first, choose hearing aid according to your hearing loss. Please go to facebook to check video.you can email us gpgoodsale@hotmail.com, we will solve the problem for you. Super mini size with pulling line: The machine size is 0.66*0.55 inch, it can hide well in your ear. Pulling line can help you take machine out. Hearing amplifier is belongs to electronic product,it is normal if you hear noise. Please be patient to adapter to it. First week: Wearing in quiet enviroment. If you can't hear any sound, please don't give up. Second week: You can try to go to park. Third week: You can go to public,but remember please don't stay too long. Fourth week: You can go far. For left/right ear, slight/moderate hearing loss: There 3 size ear tips in the package. Please chose the right one, make sure ear tip is tight with your ear. For noise reduction, another solution is turn down the hearing aid volume as possible. Turn to 1-2 volume level is enough for first time wearing. If can't hear clearly, you can turn up volume slowly. We suggest you to wear 8 hours/ day, you will feel comfortable after 2-3 weeks. Personal sound amplifer:The analog hearing machine is for kids/adults.You can use adjust bar to change volume. It is much conveniet for old people to use. 1.Connect ear tips with machine, please make sure ear tips is really tight with ear cannel.2.Insert battery A10 in right position.3.Turn volume from level 1-2, after adapter to it, you can turn to high volume slowly. Because this machine is small, so the working voice is not loudly.4.Please turn down volume into level1 to reduce battery cost. Accessories: 2pcs packing set achieve your different demand(Buy battery search ASIN: B07D2H8FGB, 1 battery working time is about 29 hours). 3pcs ear tips(3 types different size) you can choose the right size according your ear canel. 1pcs adjustable bar, you can change volume throught it easily. Adjustable stick must be aligned with amplifier position.1pcs English manual book.Silica gel packing box avoid damage during shipment. FDA certification: It is certified by medical institutions around the world. For 1 year warranty, please contact us if you have problems. You can use brush to clean arround ear cannel, volume control buttom, battery compartment or other tiny thing. Gently wipe the hearing aid with a soft cloth. Please don't use solvents, cleaning fluids, or oils to clean your hearing aids. Remember to turn off when no use, otherwise a buzzing sound will be generated, which may cause cause unnecessary loss. View More In Hearing Amplifiers. If you have any questions about this product by GPFATTRY, contact us by completing and submitting the form below. If you are looking for a specif part number, please include it with your message.